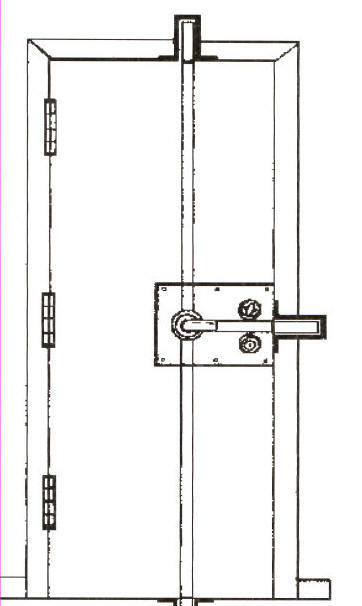 Secure-a-door Manufacturing is interested in selling the rights to manufacture the 3 bolt locking mechanism including drilling, machining and assembly table, all jigs, engineered drawings and enough inventory for 50 doors and samples for other products. Owner wishes to retire. Secure-A-Door Manufacturing Inc. is an innovative manufacturing company that has designed and developed a revolutionary new 3 point locking mechanism that will virtually eliminate forced entry through any residential or commercial doorway. This product has been tested in some of the most extreme environments for rusting, shifting and other potential manufacturing and design flaws, and has passed all tests with flying colors. penetration tests and found that after nine attempts with a two man battering ram, the door was still intact, although a little dented. Our philosophy is that no person should have to live in fear of assault, robbery, break, enter and theft or even terrorism. We may not be able to protect your streets, but we can protect your home. We also believe that you should not have to "cage" yourself up to protect yourselves, your loved ones or our hard earned possessions. You should not be the one behind bars... This is why Secure-A-Door has designed the most effective and simple security strategy, that offers an entire security package to protect your home, transparently. Secure-A-Door offers a number of affordable security combinations and alternatives to protect your home, your personal assets and most importantly, your family. 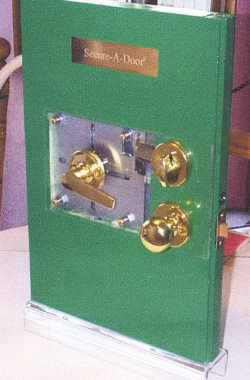 The special "one turn" bank vault type locking mechanism is what gives this specialized device its strength. There are three high tension treated steel rods that span across the door. When the handle is turned down, these rods protrude into steel tubular sleeves that penetrate through the door jam, and into the secondary wall stud to provide additional resistance to applied force. The locking mechanism comes with a 10 year limited warranty. 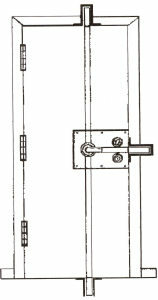 As a result of the "bank vault" concept, any force applied against the door is distributed evenly across the entire door, disbursing the force from the point of impact. This will also minimize the force applied on the door jambs and wall studs, resulting in a FAILED forced entry. Company is currently operating in Winnipeg, Manitoba. 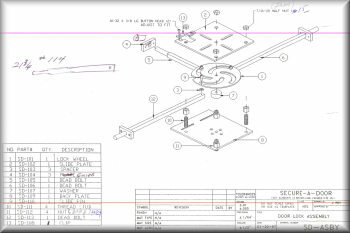 Licensed Assembly Distributorship Can Be Established Anywhere in North America.